Nauru children: Why did we wait so long? The government's assurance that it will move most of the remaining refugee children from Nauru by the end of the year is welcome. It came after doctors, nurses, judges, Wentworth voters and Coalition backbenchers had responded publicly to the evidence of acute mental health issues among children on the island. The policy of preventing the children of people seeking asylum from coming to Australia is increasingly seen by ordinary Australians as cruel. It is no longer an electoral asset but a potential liability. The decision is particularly welcome as Christmas approaches. Australian Christmas focuses on children. Children count down the days till it comes, and families try to make it a magic time when children feel loved and can return love through gifts. It is an appropriate time to free refugee children from hopelessness. Christmas, and particularly the first Christmas, also raises broader questions about Australian refugee policy. It makes us ask why adults are left to languish on Manus Island, Nauru and in Australian detention centres. They, too, were children once. It also makes us ask why the government had so strongly resisted transferring to Australia children so clearly at risk. To distant observers the hesitation and delay are hard to understand. They ask how it is possible to look on idle and unmoved at children in despair when you are in a position to address the causes of their despair. Their question can be heard as a reproach, but it is better understood as asked out of curiosity. What is it that enables us to pass by damaged children, untroubled? The answer may lie in the quality of our moral imagination. 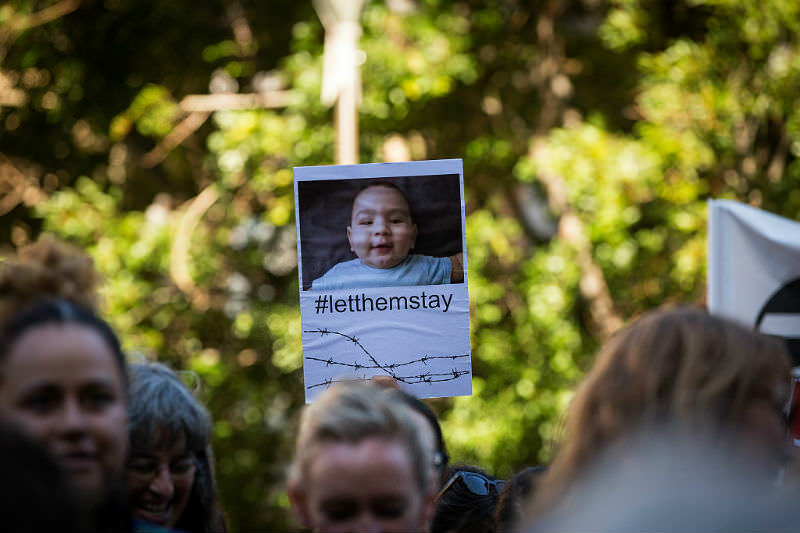 What do we see in our mind's eye as we consider the children on Nauru? It is possible to see them abstractly as members of a class — asylum seekers, illegal immigrants or security threats — and not as unique persons, each with their own dignity and inner life. If we see them in this way, we shall more easily approve of treating them instrumentally. We set them in a chess game in which as pawns they may be sacrificed in order to save the queen. The suffering to which we have condemned children on Nauru is then seen as unfortunate but also as necessary to deter other people from coming to Australia and so to preserve the integrity of our immigration policy. We might even pride ourselves that we have had the strength of character to overcome our natural sympathy and to focus on the larger good. "When we imagine the children on Nauru and the men on Manus Island we look into their eyes and see scars from their being treated as means to someone else's end. And we count down the days until they are free." More commonly, though, we dismiss the extent of the suffering and the worthiness of those who suffer. This was notoriously the case with the Webbs and other fellow travellers who visited Stalin's Russia during years of famine and purges, lived the handsome lifestyle of the Party leaders, were confirmed in their faith in the great Russian Utopia, and returned to deny reports of starvation and of the exile and execution of millions of ordinary Russians. Tony Abbot recently described Nauru as a pleasant place to live, as if his privileged experience was relevant to the experience of children who suffered there and to our responsibility to them. A more expansive form of the moral imagination sees each human being as precious, each with her own destiny and inherent value, and so demanding of respect from others. It is outraged when it sees human beings treated as instruments for policy goals extraneous to them. When we imagine the children on Nauru and the men on Manus Island we look into their eyes and see scars from their being treated as means to someone else's end. And we count down the days until they are free. These two forms of the moral imagination are represented in the stories of the first Christmas. They offer the expansive vision of a God who loved the world and each person in it so much as to enter it as a little child dependent on other people's love and respect. The story invites people to treat one another as precious and with respect for their inherent worth. The instrumental vision is represented in King Herod. In order to remove a perceived threat to his rule and to the security of his people he had all the small children in his kingdom killed. He saw their deaths and the grief of their parents as an acceptable price for larger goals. At Christmas time we might rejoice with the children brought from Nauru to Australia. We might also hope that their release reflects a change in the moral imagination of politicians, and not simply a changed instrumental calculus. And we should continue to press for the children and their families to find a permanent home in Australia and for the release from Manus Island and Nauru of all people who have sought our protection. Christmas puts human beings first. An excellent piece, thank you, Andy. Dare I say it, our moral imagination should extend even further to those turned back at sea by our military at sea to death or torture somewhere away from the cameras. That's a thoughtful and compassionate article Fr Andrew. And a good analogy about Herod, but who do we cast in that role in today's dog eat top dog world of Australian politics? Perhaps the Minister of Home Affairs. As Shakespeare said "Yon fellow has a lean and hungry look". And I wonder, since Tony found Nauru such a pleasant place to live, whether we could set up a camp on Christmas Island (no pun intended), so that all ex PMs could be forced to spend 2 weeks of the Christmas break behind bars in another pleasant transit camp? This morning at church I sat in the pew in front of a family - a mother, father, a young child and a baby plus grandparents. The young child, a girl, made some noise during Mass and at the end of the service I turned and spoke to the grandfather who was holding the girl. I said "Children are the best part of church aren't they" and he replied "Absolutely. The best part." They are also the best part of any society and it's difficult to reconcile the Australia I love with the awful detention centre policies. We can hope that the refugee families and single people will be allowed to stay and the children flourish as they should. Thank you once again for your insight. How could I have forgotten Herod? What a terrible but apt analogy. Now the test comes. Will Australians remain firm and demand of their politicians the same justice and compassion for the adults left behind on Nauru and Manus? How much longer must they endure the hopelessness of being in a place without a future waiting for politicians to dispose of them at their convenience. Are they to remain instruments to be used or can we also imagine their faces, hopes and humanity and bring them here to receive the care and genuine resettlement which they deserve. We always learn to see through the eyes of another. That innate desire of another, in this instance the prisoners on Nauru and Manus, make available for us to see what we can now see. Our expedient, ideological driven politicians who for so long have seen us as pawns on the chessboard of life have been forced to see that they grossly underestimated something precious in the psyche of many Australians. Those politicians failed to realise that people when they see the face of the suffering other have a moral imperative to do something. It has been the suffering faces on those children in Nauru that are now the start of our being transformed and as a consequence make us a more empathic and human people. Moral imagination seems to be a rare and valuable quality indeed. Many - perhaps most - of us can imagine and have compassion for the suffering of children, though usually more for the children we can see. Fewer of us have the moral imagination to recognize the sufferings of adults, whether within reach of cameras or not. Is this because we believe there's a chance that they're not totally innocent, so that even the possibility of fault excuses us from recognising their suffering? And, indeed, they may not be perfect - but have they deserved what we've done to them once they arrived here? It's not just lack of moral imagination we suffer from. It's also self-righteous arrogance that enables us to judge and sentence them, without trial and without compassion. There is reason for the current policy, and it is to discourage the attempted smuggling by sea of thousands of waiting and non-registered potential asylum-seekers, many hundreds of whom would we know die in the process. The obvious solution was negotiated with our Asian neighbours by Julia Gillard and would have meant orderly processing in Malaysia and Indonesia and orderly placement in Wester countries including Australia. This proposition was torpedoed by the Greens and Tony Abbott for purely base political reasons. Words are cheap. I find the two sentences "Their question can be heard as a reproach, but it is better understood as asked out of curiosity. What is it that enables us to pass by damaged children, untroubled?" the most telling. And I wonder how Australia could come to this? Once the shining light of humanity on the world stage and the champion in the UN and in international reputation of generosity and integrity (albeit more than a little schizophrenic in regard to our own indigenous people). Now we are highly respected in authoritarian circles and countries for the "Australian Solution" and our offshore concentration camps. Hurray for us! It has to be said that the politicians who stood by and allowed the suffering of asylum seekers for so long must have a certain amount of callousness towards human suffering. The same politicians also aided and abetted the genocide and human rights abuses that were carried out by the Indonesian military in West Papua, Acheh, East Timor and Indonesia itself and said nothing about the human rights of the Palestinians as their land was taken, their houses bulldozed and many were shot when they protested. Hopefully, the same politicians who finally decided to listen to those people of goodwill in relation to the children of asylum seek will also act to help the plight of the Palestinians and West Papuans who still suffer from the murderous actions of the Israeli and Indonesian armies on a daily basis. Uteruses, and in particular, periods, have long been used against menstruators — to malign, to marginalise, to make us feel lesser than. In ancient Greece, it was thought that the uterus (hysterika) was able to travel throughout the body, and that a wandering uterus was a sign of mental illness. The word hysteria has been used since then to minimise the severity of women’s mental health issues. That this attitude persists at the executive level of arguably one of the biggest sporting organisations in the country despite the role women have played in the success of the game is quite damning. That it took a woman, or women, to change it is hardly surprising.